Well here we are at the dawn of 2016, time marches on relentlessly. We have achieved so much in 2015 but this new life is a continuous succession of challenges. This year we set off into the Pacific and waters unknown. Rick points out that when we swapped our house for a boat, as we set off from Southampton for Plymouth, did our first night sail, spent time at anchor, crossed our first ocean, it was all unknown and this is just another step. However as we waved goodbye to Rachael, Matt and Robyn for a moment our links to home and our comfort zone seemed stretched thin. Boxing Day brought yet another day of squalls, we were headed for the reef studded bay at Clifton on Union Island, with the hope of being able to snorkel straight off the boat. But with the weather being so stormy and the reefs so close we decided we should stay for as short a time as possible. We did have to go ashore however, as Union Island is the most southey island of the Grenidines to have customs and immigration and before we could enter Grenada we had to check out. This is one of the downsides of island hoping in the Caribbean, each island or group of islands is a new country and requires you to fill out a huge form in quintuplicate or whatever five copies is, on entering and again when you leave. This process takes place in a variety of drab offices, manned by stern and bored custom officers. You are advised to treat these formalities with due respect and to be smartly dressed, not so easy when you have arrived by dingy, are soaking wet and are protectively clutching all your precious documentation. You are often required to queue at three different offices that each take money from you for various unknown reasons and to get your five forms stamped, they do this with such relish you wonder how long thier rickety desks will last. Paperwork all correctly completed we stopped for a beer, Union Island was quite different from the islands we had visited so far. Between the small town of Clifton and customs at the airport, a five minute stroll, was a goat farm. The town was sleepy and friendly, the locals proudly announced it was the Caribbean of the 1960’s. We would have liked to stay but the straining of the anchor against yet another squall persuaded us otherwise and we sailed on to the Island of Caraicou, part of Grenada and another customs office. Papers again stamped we settled at anchor in Tyrel Bay where we spent a pleasant couple of days dodging the rain showers and relaxing. 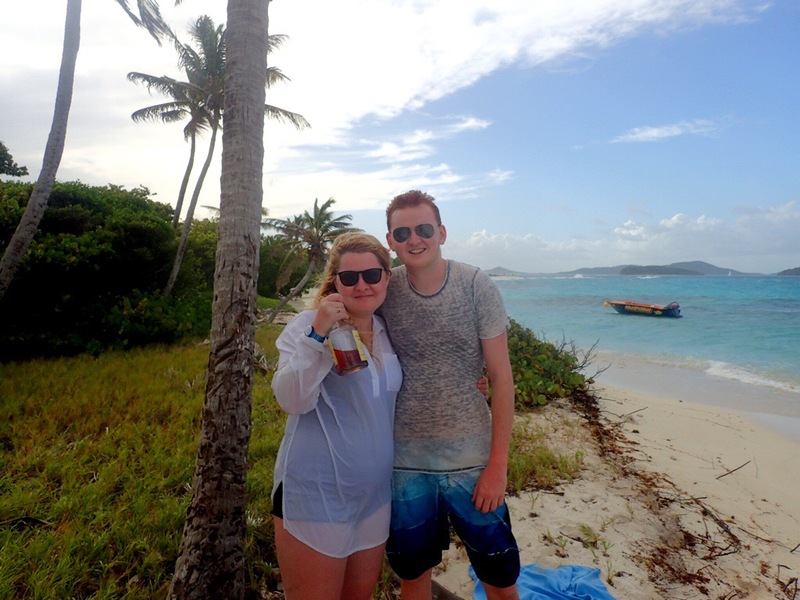 There was a nice beach, yet another good beach bar and a mangrove swamp to explore in the dingy. The visibility for snorkelling hasn’t been brilliant but we did have a final swim at the marine park just north of us here in St Georges on Grenada. 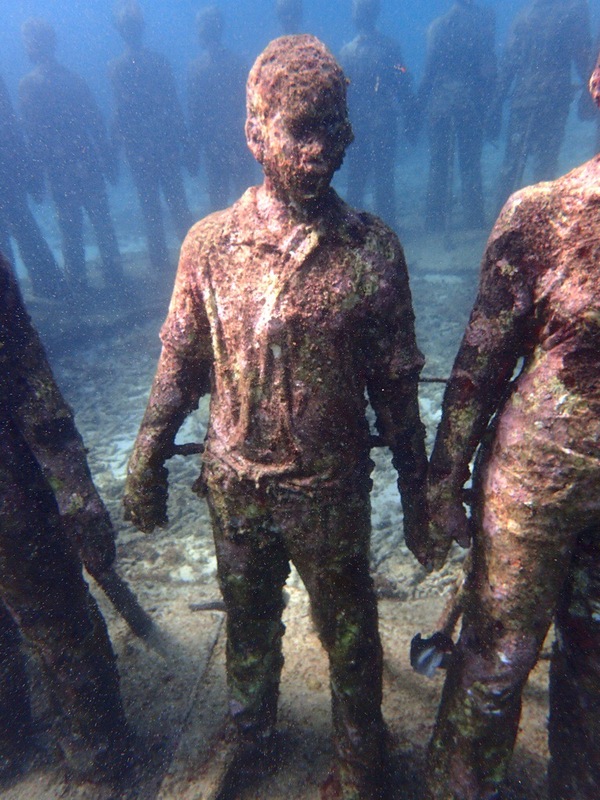 Statues have been placed on the sea bed and make for an interesting sight amongst the fish and the coral. We are now moored up in the very plush – great showers and Internet cabled to the dock, Port Louis Marina, St George’s where except for a few days to explore we are based until Jonathan and Sheridan arrive and we head to Panama. Tonight there is a big New Years Eve party, at lunch time we sat and listened to the band setting up, they were brilliant so we have bought some tickets, have put on our dancing shoes and are heading across to join in. Here’s hoping our ears can take it. Happy New Year. Rick and Ros – What a fantastic 2015 you had especially the ARC 2015 with your successful win of your element of the race. May 2016 bring you even more success with the next part of your journey. Happy New Year and best wishes for 2016. Great to hear from you, hope all is good with you, give my love to the gang when you see them. Hi I am so sorry I was not able to speak the other day when you rang, we were out walking and the dog had run off and my father fallen over so I was trying to get him home and find the dog. For some reason i have lost both your mail addresses hence and having to comment here. HOpe all well and let me know when we can chat.